In the next 21 days, you will do just that! Each day will have a focus and tasks for you to do to make or save money. It’s up to you if you choose to focus on saving money, making money or both! Tips will be shared on the blog, as well as Instagram, Facebook and in The Thrifty Issue Facebook Group. Before you get started, I want you to define a goal for yourself. For example “In the next 21 days I will save $1,000” or “In the next 21 days I will find a new way to make $1,000 extra a month”. Set a goal you will be able to see and that will help you financially long term. Next, make sure you are signed up for the best Australian Cash Back sitesso if you do any shopping online, you get money back. At the end of this 21 days I want your feedback plus you will have the chance to win some of my favourite things to help you make and save money! There will be multiple prizes plus some giveaways throughout the month! 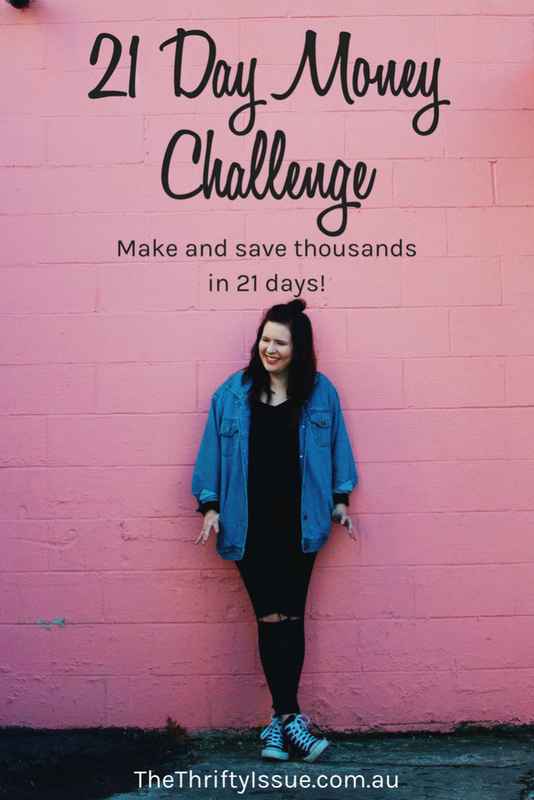 I will be joining the 21 day money challenge. My goal is to create a way to bring in an extra $500 a month. I’m joining and my goal is to make an extra $1000 a month to be able to save atleast $500 per month. That is a wonderful goal! I know you can do it!